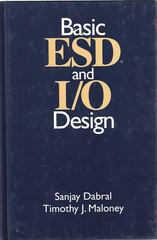 A text devoted to electrostatic discharge (ESD) and input/output (I/O) design. design principles that can be applied widely as the field continues to evolve. students involved in core VLSI design or computer architecture. reader consider ESD and reliability issues up front when making I/O choices.